The Union faithful have been donning their Sherlock Holmes deerstalkers this offseason. They been dealt a small handful of clues to answer some pretty big offseason questions. Was their 2018 season really their best ever? What became of Borek Dockal? What new tactics will new GM Ernst Tanner ask Jim Curtin to employ? How did they actually land their biggest signing ever in Marco Fabian, and what does this all mean for 2019? So let’s begin our tour to unravel these not-so-elementary mysteries, my dear Dr. Watson…. At 40-1 to win the MLS Cup the Philadelphia Union aren't extreme underdogs, but they aren't the darlings of prediction season either. The Union made just one significant signing this offseason as they gave cap space to the Chicago Fire in exchange for David Accam, who replaces the departed Chris Pontius. The Union lost two other reasonably important contributors in Oguchi Onyewu and Roland Alberg, and that pretty much sums up the offseason for the Union, and the reason why there is no buzz about the team. But the unthinkable does happen in the world of soccer. Two years back Leicester City caught the soccer world by storm by winning the Premier League after oddsmakers put their title hopes at 5,000-1. They did it with exceptional defense and a rigorous commitment to the counterattack. With the acquisition of Accam, the Union could potentially set up in a similar fashion and might just be the unthinkable surprise of the season. Here’s how. The Earnie Stewart era in Philadelphia has been marked by change but the Union haven’t quite been able to emerge from their history of mediocrity and underperformance. Change, mediocrity and underperformance - remember those words. They underpin the state of the Union. First let’s take a look at a picture of pure mediocrity - a history of the Union, through the results of their three coaches across seven years. Fancy graphs after the jump. Toronto FC and Philadelphia Union enter the playoffs in undesirable form and have experienced opposite trajectories in the regular season. After a stale first half of the season, TFC has regained talented players from injury (welcome back, Jozy & Giovinco!) and have lost only three times since mid-season. This form tailed off as they closed out conceding six goals in three games. The Union began their campaign proving most people wrong by winning with an up-tempo, athletic, well disciplined style. But the wheels fell off around mid-season and the Union are historically bad for a playoff team. The 2015 MLS season was Philadelphia Union's worst points haul in their existence, both in league and conference totals. In Jim Curtin's first full season as head coach, recently having the 'interim' title stripped, the Union were ponderous, soft and lacked a dangerous cutting edge and consistent goal scorer. DDLLLWDLLLL. By starting the season 1-3-7, the Union dug themselves a hole they never recovered from. Besides brief puffs scoring spurts from C.J. Sapong, the only consistencies the Union could grasp onto were indications of confusions of identity and the inability to impose their will. Floundering, season-long poor Elo totals, a bottom of the league possession% (46.3) and Fouls (11) per game, a bottom-five in the league shots per game (11.2) all pointed towards the previously offered adjectives. A year that the club will quickly try to forget was signified near the end of the season with the continued restructuring in the back office and on the field. After Curtin was given the reins in his first coaching job, the end of 2015 saw CEO Nick Sakiewicz and ex-USMNT player and AZ Alkmaar's 'Director of Football Affairs' Ernie Stewart named 'Sporting Director' in Philadelphia. Read more about Stewart's style after the jump. In preparation for this weekend's games (they're actually happening! ), we've been writing two team previews per day for the last two weeks. Going in reverse order of 2014 finish, ASA and our (very) small band of writers have published 20 articles, covering each team's 2014 season, their offseason changes, and their prospects for 2015. If you haven't read them all yet, AND WE KNOW YOU HAVEN'T, then you can catch up here. Another weekend, another bunch of ones and zeroes on the scoreboards for the games I checked out. The season's a quarter done now for just about every team, and reality is starting to set in that playoffs are only going to be a dream for some this year. Still, MLS is a league of incredible parity and almost everyone still harbors dreams of the postseason, no matter how realistic they are at the moment. It's nearly impossible to analyze this game without spending a bulk of your attentions on second half stoppage time, when both goals were scored. Not only that, but LA's Juninho had a breakaway chance to put the game away and was bundled over with no foul called. All in all, it was a pretty incredible conclusion to a game that was fairly entertaining, if not particularly well-played. To some degree, it was more of the same for both teams: the Galaxy struggled to finish the chances they were able to create, and Portland looked out of sorts and a little slow compared to last year's high-octane outfit. I want to spend a paragraph here talking a little about the apparent tactical trends of the league at the moment. For the last couple years, it seemed like the formation en vogue was the high-pressing 4-3-3: Kansas City and Portland were the most notable success stories using this setup. But this year, it appears the trend has shifted to the 4-4-2 with a diamond midfield, a la Real Salt Lake. It seems like every team in the league has at least experimented with it this year, from LA to Colorado to DC. 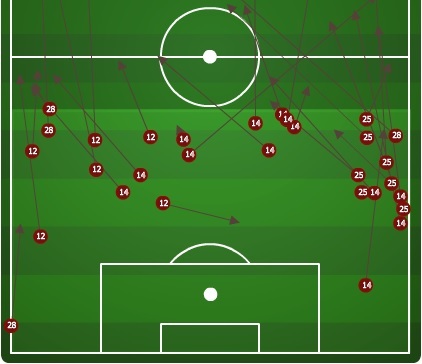 The MLSSoccer.com March to the Match podcast did a great feature on this tactical trend a few weeks back detailing some of the pros and cons of the formation. Anyway, this game seemed like a pretty decent case study with these two formations facing off with one another: Portland's 4-3-3 against LA's diamond midfield. It's my opinion that the narrow diamond midfield does a great job of neutralizing what made the Timbers' 4-3-3 so effective last year - that's part of why RSL just seemed to have Caleb Porter's number last year. Portland was at their best last year mainly because of two guys: Diego Chara and Will Johnson, who played as a double pivot and covered more ground than the Trans-Pacific Railroad. However, the Galaxy's narrow midfield boxes that double pivot in with four central mids who are all tucked inside, limiting the number of balls Chara & Johnson can win and thereby limiting Portland's possession. There are plenty of other reasons the Timbers haven't been great so far this year, but it's a trend worth watching as they try to turn their season around. It's no secret that Columbus started out this season like gangbusters and have since played more like busts. The reason for this is inherently simple: they only have one way of playing. Every single game from Columbus is basically the same: they play the same guys in the same roles and try the same things. It caught teams by surprise in the first few games, but now that the opposition knows what's coming (short passes out of the back, fullbacks getting way forward, etc.) it's gotten a lot easier to beat. And now it's up to coach Gregg Berhalter to make some adjustments and at least give the Crew a plan B so this losing skid doesn't continue. Vancouver has sneakily been one of the surprise stories of the 2014 MLS season. Everyone knew they had a good deal of young talent on the squad, but nobody was sure how the chemistry would work out under first-year coach Carl Robinson. So far, returns have been impressive. Not only has Robinson set the team up in a position to be successful tactically, but he's handed over a ton of responsibility to the youngsters to great effect. With veterans Kenny Miller gone and Nigel Reo-Coker perhaps on the way out, even more of the load is going to be heaped onto the 25-and-under players. During this victory, the only midfielder or forward in the starting eleven over 25 was Pedro Morales (28). And even when they made subs, they brought on 20-year-old Omar Salgado and 21-year-old Russell Teibert - I'd say the future is bright in Vancouver. It's interesting that a lot of season previews of DC United focused on if the wide play would be good enough to get quality service for new striker Eddie Johnson. I say this because DC has been as good, if not better, as anyone could've hoped, despite the presence of roughly zero wide midfielders and zero Eddie Johnson goals. There are obviously a few reasons they've been so good, but chiefly among them is that this is Fabian Espindola's team. He's played better this season than I ever remember him looking in Salt Lake as the focal point of United's attack, orchestrating everything and creating a lot of chances. 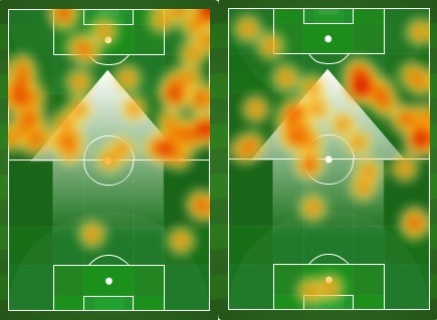 He does this by floating to the wide areas of the field to provide some width to DC's narrow formation, as his heat map above shows (EJ's actually pretty good at this too, particularly when holding the ball up). Philadelphia was everyone's darling in the first few weeks of the season. All their new acquisitions looked really impressive, they had a young and improving defense and some talent up top that was sure to start banging in the goals soon. Fast forward a couple months, and the bottom has fallen out. This loss was their ninth game without a win, they've switched formations like four times hoping for a spark, and their coach might get fired soon. So what's wrong? Lots of things. But #1 in my book is simply that the Union didn't seem that interested in playing soccer against DC this weekend. I can't tell you how many times I've seen Philly midfielders or defenders or really anyone just watch an opposing player run by them or pass the ball by them with little to no contesting. And this isn't a problem for one or two players, it's the entire team. Sorry to be such a rah-rah coach type who says they just need to try harder, but the Union need to be more active, or engaged, or try harder....whatever wording works best. This was certainly the premier game I tuned into this weekend: two teams fighting to stay near the top of the Eastern Conference and who play entertaining soccer. Both teams played pretty well, too, for the most part - a notable exception was the first ten minutes when Red Bulls were terrific and Columbus was sleepwalking. NYRB would look back on these first ten minutes with great angst, as great saves by Steve Clark and near misses by Eric Alexander and Thierry Henry made them all go for naught. New York would eventually get their goal through the red-hot Bradley Wright-Phillips, but also gave up their share of great chances that required big saves from Luis Robles. All in all, this was probably a game where both teams left fairly content with the result and how they played. I went over the game from both team's perspective above, so I'm going to use this space to talk a little general soccer strategy. Each and every game I ever watch, a wide player will receive a ball in the attacking third with forwards and attacking midfielders streaking into the box. And probably 80% of the time, the winger slows down and takes a touch to steady himself before crossing it, thereby forcing his teammates crashing the box to stop or delay their runs, and allowing the defense a chance to get set and defend the cross. Every time this happens, I get inexplicably angry. Crossing the ball with the first touch is admittedly more difficult and not always the right play, but it overjoys me to see Crew wingers (especially Hector Jimenez and Josh Williams) send in these first time crosses. Of the 23 the team recorded against New York, I counted 7 that were on the wide player's first touch. Oh, and the one that led to the team's lone goal? First time. I used this stat for one of the games last week, and it's a bit of a tough one to quantify. 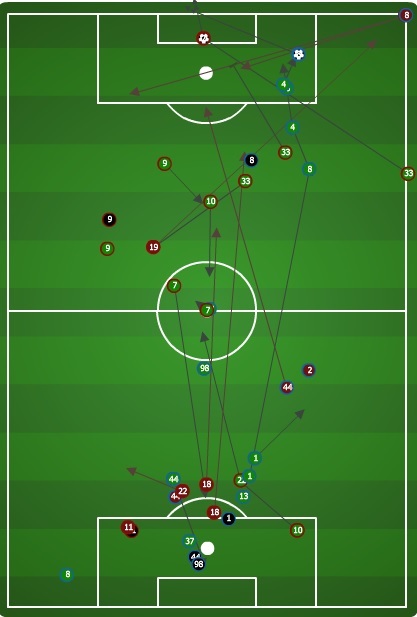 I included the above image to show how I figure: 15 of the unsuccessful passes by Philly defenders ended in their defensive half (one of which led directly to the game's lone goal). For a team who have as impressive moments as the Union have early in the year, this kind of sloppiness out of the back really hurts. I don't want to heap all the criticism on Amobi Okugo, Sheanon Williams and the other defenders, because the truth is part of the problem stems from the midfield. As good as Maurice Edu and Vincent Noguiera look at times, there's often a conspicuous lack of anyone getting open in the middle of the field for the back line to pass to. The point is this: Philadelphia has certainly looked like a playoff team at times and probably deserves to have more points than they do, but at the same time are usually their own undoing. When watching the Impact this weekend, I was struck by the fact that four attackers in their formation were actually pretty creative and fun to watch. Jack McInerney, Marco Di Vaio, Felipe and Justin Mapp do a lot of good work interchanging and creating chances (especially on the counter). But their defense is fairly fragile, and because of that they play two central midfielders who concentrate on defending first and foremost. This leads to Montreal never really pushing up the field and keeping possession in the attacking half, which ends up putting a lot of pressure on them to defend for heavy minutes. This is one of many reasons that Montreal are near the bottom of the standings; on the other hand, those four attackers can be good enough to win some points on their own at times. Chivas had to be disappointed to lose this game. They outplayed the Earthquakes, particularly in the first half. They had more possession and more chances than San Jose on the whole, but they were really lacking in quality for the final ball/shot. A prime culprit on this was also one of their best players on the day, young electric winger Leandro Barrera. He mostly plays with the same strategy as guys like Fabian Castillo or Teal Bunbury; that is, run really fast past the defender and try to cross or shoot. Unfortunately, the end of that sequence is a struggle for Barrera: you can see from the image above that his crosses were as likely to fly well over the goal as they were to find a teammate in the box. If he can improve his service, Chivas should see an uptick in their goal scoring. San Jose wasn't overly impressive in earning their first win of the year, but the second half was markedly better than the first. Admittedly, some of this was due to Chivas playing the last portion of the game down a man, but I think the largest reason for the second half improvement was the introduction of Yannick Djalo to the game. Bringing in a true wide threat stretched Chivas' midfield quite a bit, which was stocked with 3 center mids and two wide players who were wont to tuck inside. This led to the Goats controlling the midfield and winning a lot of balls in the first half, but they were spread thin and had a harder time in the second stanza. To wit: Chivas had 20 recoveries/interceptions to San Jose's 12 in the first half, but were out-dueled 17-14 by that measure in the second. Once Djalo is healthy, he needs to be on the field all game: it's clear that his presence brings a threat not only on the ball, but it also helps the team in other ways. 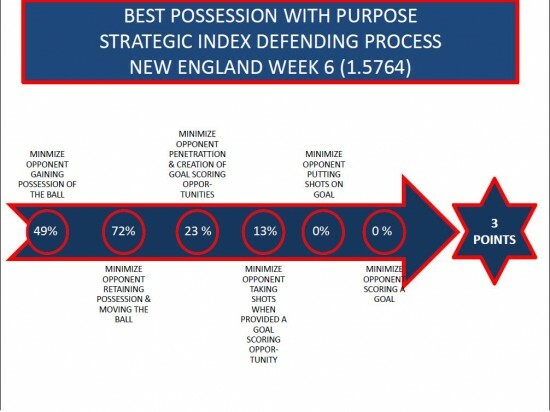 Those living up near the northeast coast of America should be pretty chuffed with that result this weekend against Houston - an early season defensive-minded team came in to visit, and the Revolution re-educated Kinnear and his Dynamo on what a defensive-minded team really looks like. I'll get to that in a minute, but before doing so, my link to what PWP is all about and then my recap on my PWP-Pick-List for last week and how the end results shook out. In the future, look for the Pick-List in its own post. Chicago at Montreal - Truly an interesting game between Yallop's style and Klopas's style. I had originally considered this might end in a draw but after thinking a bit more about how weak the PWP Defense was in Chicago last year (under Klopas) and how weak the Montreal defense is looking this year (under Klopas) I think Chicago takes 3 points. Houston at New England - That red card really hurt Houston and perhaps Brunner? gets the head nod to replace Horst. As for the Revolution - they have a solid defense but can they score? I think Houston can get at least one goal up north - I'm just not seeing the same for New England... Houston wins. Seattle at FC Dallas - Another tough road match for the Sounders coming off a lucky tie against Portland last week. In all fairness the Timbers dominated large parts of that game and they exposed the weak center of Seattle. But FC Dallas also have a weak center - this could be another 3-3 draw but the edge goes to Seattle with Traore returning as center-back in place of a very weak defending Anibaba. Chivas at Portland - Can I really opine anything different than 3 points to Portland? I'll put it this way: if they don't get three points against a very disorganized defense like Chivas there may be major issues in Soccer City USA. Vancouver at Los Angeles - I'm not sure anybody beats LA in LA this year. LA wins. A late surprise for me was seeing how well Philadelphia performed this past weekend against a very strong Real Salt Lake - granted it was the 90+ minute mark before Edu equalized, but there's never a wrong time to score - there's only a wrong time to give up a goal. The LA Galaxy got the expected result against Vancouver - the overall outputs from LA this game were just stunning... they offered up 617 passes; more than 500 of them completed with over 100 of those within the final third - I didn't watch the game but it is likely the Vancouver defense was pulled and pushed and poked to exhaustion. That being said, the achilles heel for Vancouver last year was their defense - although they lost 1-nil they did a pretty good job all things considered - so the result didn't go in their favor but they should take some positives away from that game in how well they maintained the LA attack around that lone goal by Keene. On the flip side - Houston started the season quite strong and it is likely Kinnear will get them firing on all cylinders again. What was missing - at least in my view - was David Horst; that red card was double punishment for the Dynamo last week and his return should bring back a more solid back four. With that said - and seeing how things continue to develop - I have begun my swap out my Dynamo defenders on my Fantasy team - I'll begin to rotate in a couple of New England players and maybe someone from DC United? More to follow on that thought in my Cumulative PWP Index article later this week. A surprise for some I'm sure - the winner this week is a team that drew 2-2 - while Seattle and Clint Dempsey traveled to FC Dallas and took three points... why? In a few words that means Seattle had more quantity in creating chances within the final third while the Union had more quality with their fewer chances... this has been the norm for many teams this past year-and-a-half within my PWP analysis - quality will beat quantity - not just in the statistics of the game, but in the regular run of play in the game.... it's always good to see statistics support what the eye sees. Bottom line here though isn't the intent to minimze the success of Seattle - they took three points and Dempsey had another stellar game - but when looking at the comprehensive view of the game - more of the overall PWP parts of the game were executed better by Philadelphia than Seattle. Other thoughts - Real Salt Lake performed in the top ten again as did FC Dallas and LA Galaxy - Portland edged its way into the 7th position this week and with that draw to Chivas it's a double-edged sword for Porter - the Timbers continue to improve in the overall attack - but they also continue to lack focus for a full 90+ minutes in defense. How long before we see the Timbers begin to shake the trees to see what falls out for a defensive addition in the summer transfer window - perhaps another double-edged sword was the inclusion of Michael Harrington into the USMNT training scheme - has that reward created an issue for Harrington? It's six weeks in and the top Attacking PWP Player of the week is another midfielder - go figure. 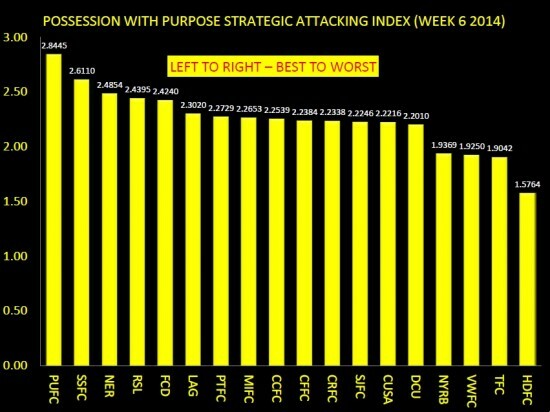 Two years ago I opined that the most influential players in attack should come from the midfield, given their increased touches on the ball and their overall vision of the game from the center of the pitch. Duly noted - Maurice Edu got a late equalizer and the Union fought back for a hard won draw against (IMO) the best team in MLS. 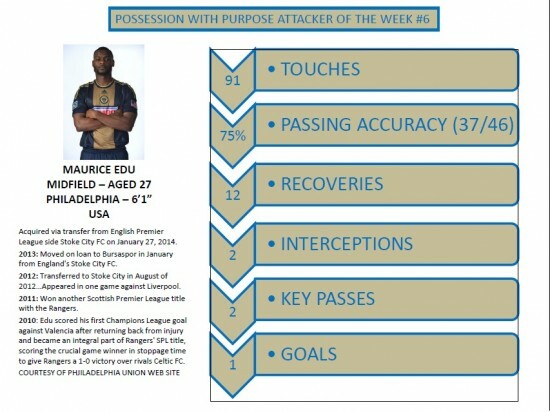 Evidence of Maurice's two way influence is above - enough said - this midfield acquisition continues to help the Union etch their place as a top team in the Eastern Conference, and grabbing a late point helps them sustain that Playoff vision. On to the Defending Team of the Week... my favorite part of this game. Note the final three steps in the overall attack mounted by Houston - only 13% of their overall penetration generated a shot taken, and none of those shots were on goal. 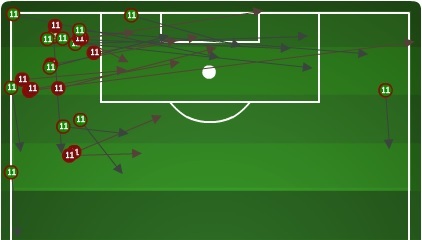 Consequently, none of those shots got past Shuttleworth--pretty stingy if you ask me. 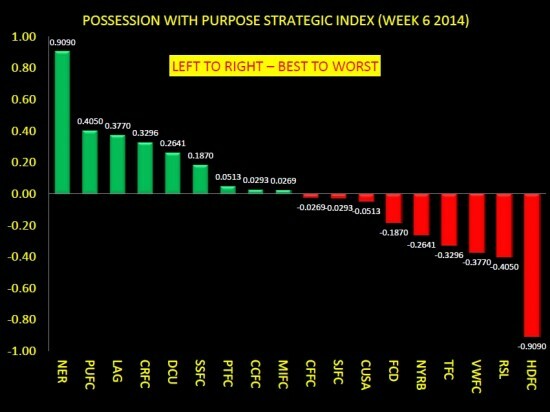 Their passing accuracy was below average, but with an average amount of possession. 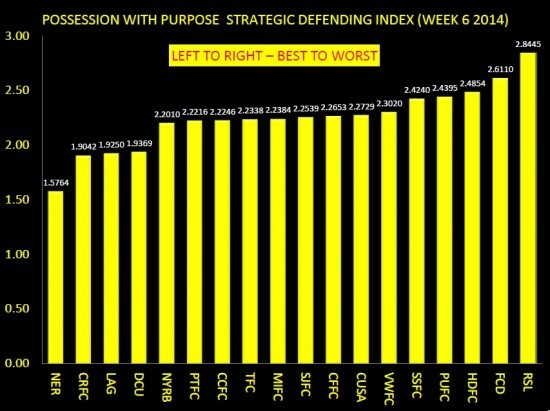 If you had to paint a picture of a team that defends across the entire pitch, it's results like these that you want to see from your opponent's attack (i.e how well your team defense performs in controlling the opponent's attack). Consistency begins to show for many teams this year - a welcome surprise for Olsen is that his team is beginning to shut down their opponents. D.C. United comes in 4th place this week against a very strong New York Red Bulls attacking side (at least they were last year). Colorado traveled to Toronto and did well--aye the Reds had some injuries, but every team this year will experience players who get injured or miss a game through disciplinary reasons. Toronto got edged out by an improving Colorado. On the tail end was FC Dallas, an unusual spot for them this year. 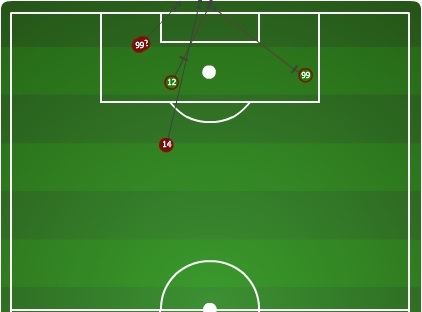 The own goal, as well as the brace by Dempsey, speaks volumes - yet as we saw on the Attacking side of PWP, Seattle were also pretty strong across the entire pitch -- the center of FC Dallas defense remains and issue and Keel did not add value in pairing up with Hedges. I like fullbacks who add to the attack, but I love fullbacks who defend first - there's a reason these guys are in defense; it's to stop the opponent first. 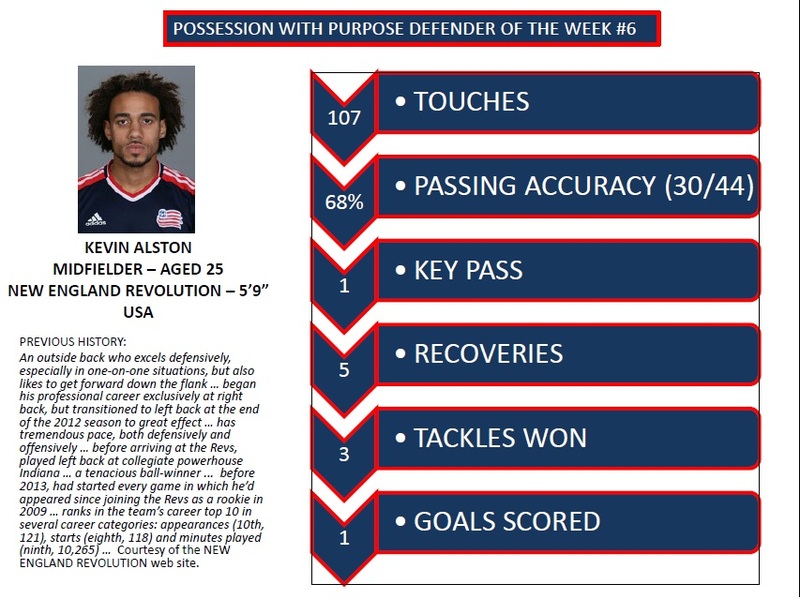 Overall, Alston did a superb job in playing his role; he not only scored, but he was also five for five in throw-ins within the final third - you'd be surprised - but at least four teams this week couldn't complete over 70% of their throw-ins within their attacking third... never take a throw-in for granted. Another storyline here is that Alston continues to work through very difficult health issues from the past - showing concentration and doing his job to support his team translates to strong character. In a country where I think good fullbacks are not the norm, it is good to see Kevin have a great game! Next up will be my PWP Pick-List for Week 7 followed by my PWP Cumulative Indices and associated thoughts. For now know that the top team in each conference is not the top team in my overall PWP Cumulative Index - lest we forget not everyone has played six games yet.